Submitted by PolyTools3D on Sun, 2013-07-14 08:05. Currently, it is possible to render the different selected models, but rendering the elements of each model is not yet implemented. Submitted by pedroamorim on Sun, 2013-07-14 07:13. I'm having trouble outputing an image that shows the uvshells with diferent colors for each model part. Submitted by PolyTools3D on Thu, 2013-07-04 16:06. Thank for your suggestion. I have it actually under development. The reason I did not release it in this version is because it is not working as it should, but I got several request to include a Stitch feature, so I included the basic version. Hopefully I will get the multiple selections Stitch for next release. The algorithm I am working on does not support multiples shells though, but you can select several edges in one shell and stitch them at one. Submitted by stealthx on Thu, 2013-07-04 14:14. Nice script! I have an idea request how to speed up basic stitch function. It would help a lot. Would it be possible to make stitch function working even if I stitch more than one group of polygons? Sometimes I have 60 or more pieces to stitch and only way to have best result is to stitch one by one by hand. Would it be possible? Submitted by PolyTools3D on Thu, 2013-07-04 09:53. Submitted by trebor777 on Fri, 2013-06-07 02:32. I had the same Issue, but it's not related to this script. Basically you just have to Assign another key to this command. Sadly Space doesn't respond well for shortcuts. Submitted by stealthx on Sun, 2013-05-19 02:07. The bug related with hot keys in the unwrap window is old at least three years. I used to use spacebar to "Select By Element UV Toggle" a lot. But today in three last versions of 3ds it works only if you are out of unwrap window focus (click in the 3d viewport). This bug as a present from autodesk slow down work a lot! Maybe everybody should report this to the autodesk and maybe in next update or next few years it will work again. Thank you for such a great script!!! Submitted by PolyTools3D on Thu, 2013-05-09 11:00. I have run into this same problem and also received a few emails reporting the it. It seems it is a Max related issue and has to do with how Max handle the Tab Controls, at least that is how it looks to me. 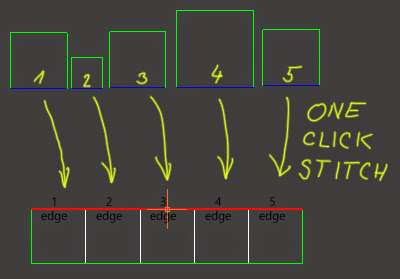 If you make the selection in the viewport instead of the Unwrap Editor, then the keys works fine, but as soon as you focus (click) on the Editor or a rollout (even in the Unwrap Modifier panel) Max takes control of the Up and Down keys and use them to tab between the different controls, similar to using the Tab key. Unfortunately I do not see a fix for this, and would be glad to know if someone has a workaround. Regarding the rotation, the current function does rotate around the center of the Shell, but what you mention makes more sense, so I will see if I can modify it to rotate around the pivot, and perhaps keep the rotation around center hocked to Ctrl key. Submitted by headd on Wed, 2013-05-08 05:43. - A small problem, though, when I decided to assign rotate/mirror to ctrl+arrows. - Another thought. Right now, the rotation is based on the selection center, not the actual pivot, because if i move the rotational pivot to a corner, the shells will rotate from the selection center. Otherwise, congrats for the script. It's a must have. Submitted by PolyTools3D on Fri, 2013-05-03 09:52. Note that the Texel Density is based on the texture size, so if you are using different textures sizes you would need to select the models separately. But you can select a group of models that share the same texture resolution and normalize all of them at once.